Looking for really distinct diamond earrings? 8 kite shaped diamonds are puzzle-set are arranged in pear-shapes totaling 1.97 carats. 1.34 carats of round brilliant cut natural fancy orangey-brown diamonds and 0.28 carats of round brilliant cut white diamonds are prong set to resemble leaf petals. 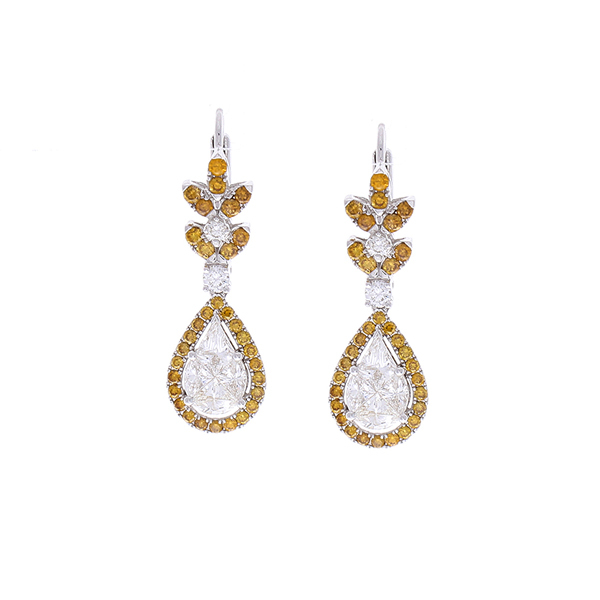 Created in 18 K yellow and white gold in a bright polished finish, these gorgeous drop earrings are impressive and truly unmistakably striking.